During his weekly talk for avreichim, HaGaon HaRav Gershon Edelstein Shlita addressed the results of elections for 21st Knesset. The Ponovez Rosh Yeshiva then addressed the secular people, who he explained are “not happy” and require our assistance. 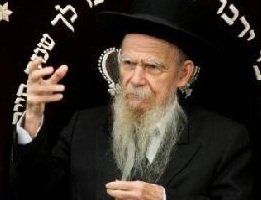 Rav Edelstein added that Baruch Hashem many are busied with trying to bring these people back to a Torah life, and every single frum Yid can influence a secular person by davening. Rav Edelstein explains that true earnest tefilos, showing the pain that others are not Frum, would have an impact. “How can we help them merit this? Thank G-d, there are many people who work in this [field], but the work is still very great, and we need to help more and more [people]! Everyone can have an influence by praying.